You may have noticed the skills crisis in construction has been getting lots of air time recently. This isn’t a new phenomenon, it has been worrying industry leaders for several years now. This, along with the decades-old issue of falling industry productivity, were major talking points at the 2017 Infrastructure UK conference and exhibition held yesterday in London. I still think there is a big, yet overlooked, opportunity that will help improve both productivity and the resource shortages. So, I wrote this article as my contribution to the debate. It seems to me that most of the focus on the link between project productivity and construction methods is on the physical building process and trades. For example, more off-site manufacturing of modular elements, repeatable design, and 3D Printing. These are good ideas as far as they go, but to me, most seem to be treating the symptoms of the problem, rather than looking at some of the core problems…like the end-end process used to procure and manage projects. “Brilliant process management is our strategy. We get brilliant results from average people managing brilliant processes. This suggests another lever that we can use to overcome the skills shortage, because I think construction is mainly in the situation of Toyota’s competitors. Managing projects is about finding great people to manage projects using a broken process, and our improvement initiatives are rarely systemic in their approach. The most common processes for managing the commercial, planning and control aspects of projects don’t reliably and consistently deliver what the project clients require – a project that is on-time as quickly as possible, and on-budget at great value for money. It isn’t easy for a new project manager to follow the process and deliver great value, on-time, and on-budget. Which in turn drives the need for more management and control resources. And more people means more cost, to say nothing of the supply & demand issues of finding good people. On-time and on-budget is actually not that difficult to achieve using the common methods of planning, contracting and project control, if you have comfortable time and cost targets, and are willing to pay for good people to manage and control the project. This point was also highlighted at yesterday’s conference by Tony Meggs, CEO of the UK Government’s Infrastructure & Projects Authority, who said that although the UK is now world-class at on-time and on-budget project management…we are not yet there on the value-for-money, cost and time benchmarks! So, whilst the people building the underlying physical asset (the trades) are in short supply, a much bigger issue is management resource! A knee-jerk reaction to this data might be to think that we need more QS’s and project managers. But that is only treating a symptom – our need for managers is driven by the underpinning business processes we use. What Alternatives Do We Have Though? 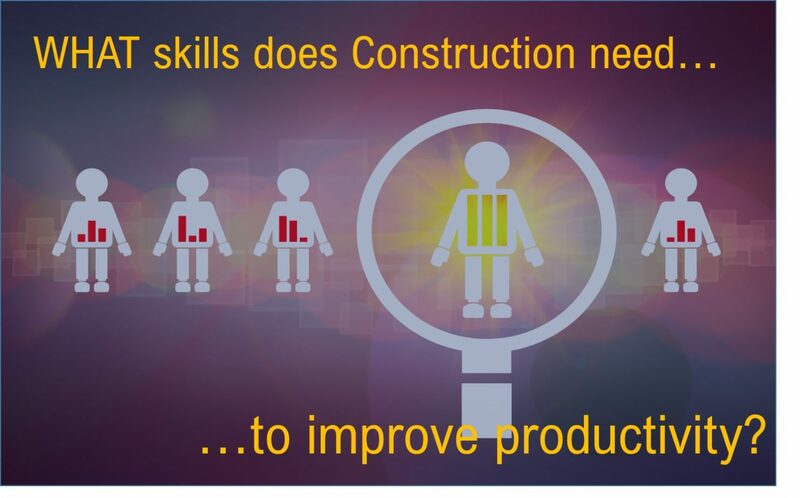 If we could find a way of managing construction and capex projects that used significantly less resource – not only managers, but all the resources projects require – wouldn’t that help our skills shortage? I think it would, and I’m convinced it is possible. In fact, the processes have already been developed and proven to work…outside of mainstream construction. When the Japanese contractor Sunagogumi first used the CCPM planning and project control technique in 2003, it was a remarkable success. An inexperienced project manager delivered a flood defence project on the Tonebetsu River in record time (from several months late in starting, to completion a month early, all within the budget). This project manger wasn’t a ‘star’ – he simply used a better method. A few years later, also in Japan but in a different sector, the car maker Mazda used the same CCPM methodology to develop its SKYACTIV engine and drive train technology. Mazda say they gained a 30-40% increase in project productivity, completed projects 20-30% faster than before, without having to change their people, just their process. They now use CCPM for the whole new product introduction process. When I heard the Mazda Chairman Seita Kanai talk about this in 2016, he called his presentation “Technology Breakthrough by Operations Breakthrough” echoing the idea behind the Toyota quotation above, that great process is a prerequisite for a sustainable performance transformation. So, average people, with new, easily learned skills, improved both their project productivity, and the profitability of supply chain, simply by changing how they plan and control their projects! CCPM does this by removing waste and inefficiency from project planning and progress control, and facilitates the quick and agile reaction to issues before they escalate. It helps projects to flow as quickly as possible. It works – though to work on construction-type projects it does require a truly collaborative project team which few projects have down the supply chain. In my view, it works best under a project alliance style of contract to integrate and align the interests of the main suppliers and contractors. If the construction sector can replicate the 30-50% improvement in resource productivity that CCPM has delivered to thousands of organisations in dozens of different project environments, it would totally change the nature of our resource problem. It won’t disappear, but it will change what we should do to overcome the problem. It isn’t an issue about the quantity of resources, or their skills in our current methods, we need to give our existing resources new skills in better ways of working. PS: The methods of CCPM and project alliancing when combined on a capex project, provide a solid collaborative foundation that the project can use to exploit a wide range of other value-enhancing methods. These might include BIM, value and risk management, safety management, project-wide databases, and Lean Construction. They also promote a much less aggressive and adversarial project working environment, which in turn should help reduce workplace stress, and attract a more diverse workforce.